***If PAYING BY CREDIT CARD- A convenience fee of $3.00 for deposits and $23.86 for tuition balance payment will apply for credit card use. There are other non fee options which include paying by check. Marymount does not receive this money . There is no convenience fee for donations. Bank Draft Option- COMING SOON! If you have a female camper who is going into the 9th grade (in the Fall of 2018) they are eligible to be a Senior Camper. Female junior campers are those K – 8th grade. There is a two-week session and a three-week session available to both Junior and Senior female campers. If you have a male campers who is going into the 8th grade (in the Fall of 2018) they are eligible for Senior Camp. Male junior campers are those K- 7th grade. There is a one week session and a two week session available for male campers. There is a non-refundable $150 deposit which must be paid after completing the online application. The deposit will go towards tuition. Follow us on Facebook and Instagram for more updates. Realizing that families have varying abilities to pay we have instituted a voluntary Flexible Fee Structure. 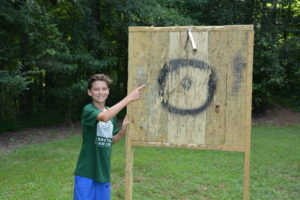 This will allow families that cannot afford to pay the Full Camp Fee to pay a lesser amount – either the Partially Subsidized Fee or the Fully Subsidized Fee. It also allows families that can pay the full fee to cover the entire cost of sending your child to camp to do that. This in no way prevents those that are most in need from applying for scholarship. Limited funds are available based on financial need. Requests for scholarship aid must be made by logging into your camper account. All scholarship money will be distributed on a first come, first serve basis to those who qualify. We do require your previous year taxes and a copy of the most recent pay stubs. All is confidential and turned over to the scholarship committee. Family Discounts only apply between siblings (brothers and sisters) in the same family. If your children attend different length sessions, the lesser discount amount applies and will be applied to the last session scheduled. Family discounts will be automatically deducted from the total camp fees when applications and deposits are received. If applications are mailed separately, please indicate that a family discount applies. * If you are able to forgo your family discount and pay full tuition we will consider the discount amount a donation to the Scholarship Fund. Boy campers that sign up and attend both camp sessions with receive a $55 multi-session discount. Camp Marymount is proud to be part of the Diocese of Nashville! In honor of our 80 year history we want to offer any employee of the Diocese of Nashville or the Dominican Campus of St. Cecilia a 10% discount on tuition rates. Please provide us with a letter of employment from your pastor or employer verifying employment with either the Diocese of Nashville or the schools at the Dominican campus. In appreciation of the sacrifice our military families give to our country, Camp Marymount extends a 10% discount toward tuition of any summer camp session to all active military families. Please send in military papers verifying active duty military status. ** Discounts are for the children of the Diocese of Nashville, Dominican Campus and Military employed parents ONLY and cannot be used for extended family in any way. A sibling discount cannot be combined with any Diocesan, Dominican Campus, or military discounts. 2019 Camp Registration opens Wednesday, Nov. 1, at 12:00 pm central time. Dates are posted under “dates and rates”.